Gain a deeper understanding of Taiwan’s cultural and architectural heritage on a tour of two prominent landmarks: the Bao’an Temple and Taipei Confucius Temple. You'll also visit a traditional Chinese medicine store, a tea factory, and Yongle Textile Market with your guide. Meet your guide at the designated MRT station in the morning. The first stop on your full-day sightseeing tour is the Taipei Confucius Temple. Enter the tranquility of this contemplative structure and learn from your guide about its Confucian influences, then stroll through the serene garden. After your visit, cross Dalong Street (Dalongdong) to the nearby Bao’an Temple, built in the 18th century and recognized by UNESCO's Asia-Pacific Heritage Awards for its restoration efforts. Marvel at the architecture and intricate woodwork while your guide details its history and Taoist philosophy. 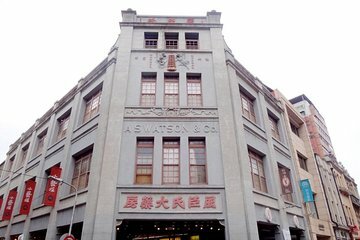 Following a walk around nearby Dihua Street, a commercial center for dry goods and traditional Chinese medicine, you can purchase lunch (own expense). In the afternoon, you're accompanied to the Yongle Textile Market for a close-up look at a vast array of colorful fabrics. Observe tailors and seamstresses at work while you browse. Next, step foot inside a Chinese medicine shop and gain insight into this ancient practice while watching traditional doctors mixing herbs. Your final stop is at a traditional teashop with a working tea factory that has been in the same family for five generations. Here, learn about how tea is cured and made, then be dropped off at your centrally located hotel in Taipei. I would highly recommend this tour and hope you get the lovely Phoebe as your tour guide because she was an absolutely GREAT guide! In addition to everything advertised we got to screen print table mats which were put to use as soon as we returned home. We even had time to visit a genuine fortune teller who was remarkably accurate in his observations - can't wait to see if any of his predictions are correct! I would thoroughly recommend this tour.